Early fall is the perfect time to begin tackling chores around your home that need to be completed before winter. One of these chores should be the cleaning of your gutters. If you need some helpful tips for cleaning gutters to make the process easier, read on for valuable advice. Cleaning gutters can be a time-consuming chore if you’re not properly prepared for the amount of physical labor involved. 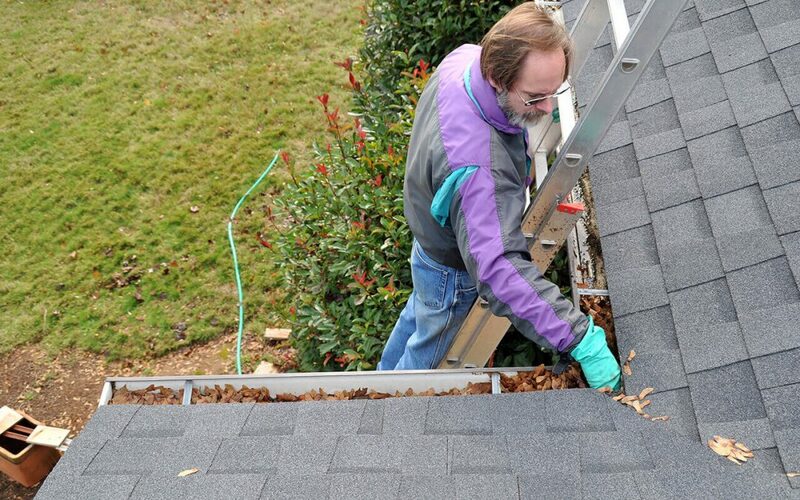 Cleaning out your gutters requires reaching, lifting, climbing, and carrying. There are tools for cleaning gutters that will make some of these physical activities easier to perform. One trick for cleaning your gutters quickly is to use a garden hose after scooping out the gutters with a gutter scoop. Make sure that the hose is equipped with a spray nozzle head that has a squeezable pistol grip trigger with adjustable spray patterns. You’ll want to set your hose to a sharp, hard spray pattern that will use the force of the water to push the debris clogging the gutter into the downspout or cause it to gather at the end of the gutter for easy retrieval. Use your gutter scooping tool to easily clean this gutter debris. Gutters are difficult to reach without the assistance of some type of step ladder or an extension ladder. When embarking on the task of cleaning your gutters while using a ladder, there are some tips for cleaning gutters to make the job easier and safer. Use an extension ladder for two-story homes and a step ladder for one-story homes. Always make sure there is someone else at home that can help should you need assistance. Cleaning your gutters can be quite a nasty business. You won’t encounter just sticks and leaves in your gutters. There are usually bird and squirrel droppings mixed in with all the gutter debris, which has bacteria that can make you sick. Be sure to use these tips for cleaning gutters to protect yourself. You do not want any of the debris or water in your gutters to touch your skin, get into your eyes, or soak your clothes. Safety goggles should be worn to protect your eyes from anything that may splash out of your gutters. Gloves made of thick suede are best to wear while cleaning out gutters because they protect against moisture and tears. Wear non-slip, sturdy rubber sole shoes on the ladder to prevent falling accidents due to slippery ladder rungs. You gutters may be made of metal, but they are still prone to damage and regular wear and tear. While cleaning your gutters, use a garden hose to spray water through your gutters and check for leaks. The water will help flush out small debris clinging to the bottom of the gutter and will also drip through holes or cracks in your gutters, exposing leaks. After you have cleaned out your gutters, inspect them for damages that may affect their performance, such as cracks or areas where they may be detaching from the roof. Fix any of these issues before winter hits to help your gutters perform better and last longer. Home Advocate Property Inspections serves Greater Charlotte and Lake Norman with home inspection services. Contact us to book an appointment.